The half-ton Toyota Tundra continues to be outsold by some of the best-selling models but it still has its values. The Tundra provides a comfortable ride and relies on the strong V-8 engines. The standard safety equipment includes the active safety systems and spacious interior is a strong side of the model as well. The durable Tundra is also available in various configurations and styles including the off-road specialized versions and premium-features-equipped variants. The TRD Sport model is also worth looking for those who value a unique styling with sports cues and a sport-tuned suspension. As for the next 2020 Toyota Tundra TRD Sport, the latest reports don’t promise radical changes. The model will stay mostly identical to the current version but Toyota was caught testing the new-generation Tundra. The next-generation Tundra won’t likely come in time for the 2020 model year and should debut as the 2021 version. Speaking about the redesigned Tundra, it could offer rear coil-spring suspension instead of the leaf springs. There could also be the air suspension as well. The model should also add a new automatic transmission and keep V-8 units but bring them in the upgraded form. There are indications that a twin-turbo V-6 engine could appear. 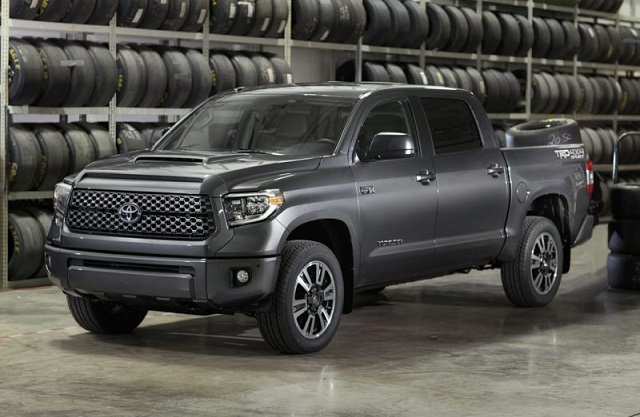 The 2020 Toyota Tundra TRD Sport will stay familiar from the exterior perspective but will stand out from other versions in the lineup with several unique features. Like every Tundra, the TRD Sport has an oversized grille combined with modern headlights and nicely fitted front bumper. The TRD Sport has, however, some of the sporty flairs in its appearance. The grille of the model has special treatment and hood scoop also add to its look. The model comes with the LED headlights and fog lights and body-color treatment is used for the bumpers and mirrors. For further distinction, the TRD Sport rides on the stylish 20-inch alloy wheels. Compared to the recently updated or redesigned rivals, the Tundra has a down-market interior but the new generation version should tidy things up. Still, the cabin of the model is functional and roomy and comes with easy-to-use controls. The TRD Sport version adds a few specific details inside the cabin and the model comes with the TRD shift knob and unique graphics and floor mats. It will also use a 7-inch touchscreen and Apple Car Play and Android Auto support. The equipment list will also include navigation system, HD and satellite radio. Toyota will also equip every Tundra with advanced safety features. An array of active safety systems includes lane departure warning, adaptive cruise control, automatic high beams, forward collision warning and automatic emergency braking. The model will also offer blind-spot monitoring and rear cross traffic alert as well as parking assist. The current Toyota Tundra relies on the two strong but thirsty V-8 engines and they come in the combination with the six-speed automatic transmission. The 2020 Toyota Tundra TRD Sport will combine a 5.7-liter DOHC V-8 with the automatic gearbox providing 381 hp and torque of 401 pound-feet. It can also equip the two-speed transfer case and A-TRAC system. The TRD Sport also uses beefed-up sway bars and the suspension system upgrades with the unique, sport-tuned shocks which should provide a smoother on-road ride. The Tundra’s 5.7L, V-8 isn’t very frugal and buyers should expect around 15 mpg combined or 17 mpg highway. Compared to fast-selling rivals which offer turbo, non-turbo and diesel options, Tundra trails behind in both performance and efficiency. 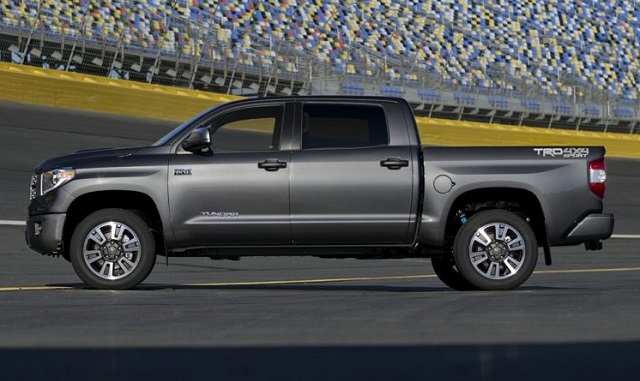 The next-generation Tundra could, however, make things better with the new twin-turbo V-6 engine and 10-speed automatic transmission as some reports suggest. The new turbocharged V-6 could be a 3.5-liter displacement based on the unit from the Lexus LS500. Some sources suggest a possible introduction of the diesel engine as well. Toyota hasn’t yet provided a teaser image or hinted some details regarding the new generation Tundra. The 2020 Toyota Tundra TRD Sport and other versions will appear by the end of the year. The price of the Tundra should stay around the same range as the current version. The base-equipped model should stay around $34, 000. More stylish and better-equipped TRD Sport will need more than $40, 000.